We all know this was the one meant to give Scorsese his first gold statue. Every now and then, there is a movie that is a can’t miss, and even before it hits theaters for the official release, it is a foregone conclusion that it is destined for great things. The Departed is one of those movies. It is the kind of movie that makes The Movie Mind enjoy writing. As fun as it is to bash all the garbage that makes it to the big-screen, it even more enjoyable to let my readers know when they can go see a guaranteed gem. 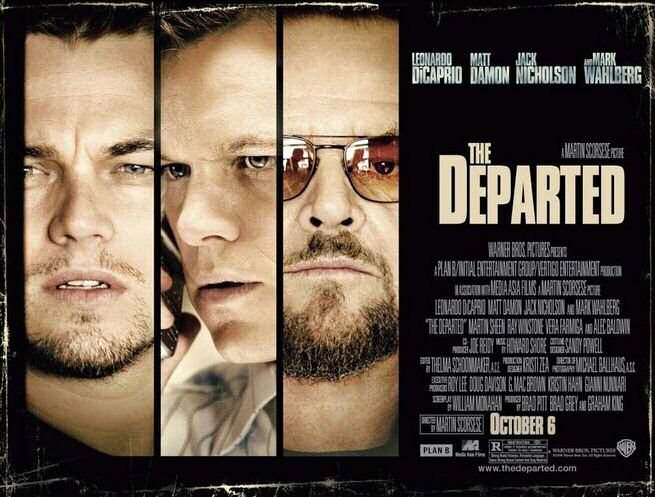 We already know that Scorsese will win the Oscar for Best Director, and that The Departed should take home Best Picture. Not that it won’t be well-deserved and long overdue for Scorsese, but part of me is upset that this is the one he wins for. Don’t get me wrong, I would have no problem if this was Marty’s third win, but it’s hard to fathom that Raging Bull, or Taxi Driver, or even Goodfellas didn’t christen him a long time ago. Again, I say that this is well-deserved, but it feels a lot better to think of it as a lifetime-achievement award instead of putting The Departed ahead of those other classics in the eyes of the real (aka fraud) critics. Jack Nicholson, as Frank Costello, stands out above the rest in the film, taking his persona over the edge with that same sort of “lights are on but nobody’s home” feeling that originally endeared us to Jack in the first place. His rants are tyrannical, and he takes it way too far past creepy in a few instances, but he still makes us crack up and almost root for him, even though he is a mob boss and has the most reasons to lose. Throw in dominant performances from Wahlberg as the only guy playing it straight up in the police department (next to Martin Sheen, in one of his better roles of all-time), and the conversely crooked DiCaprio and Damon, and you have your answer as to why this will be one of the best movies you’ve seen in a long time. Even excusing the time wasted developing a useless love-triangle (without which the film’s length would have been far more respectable), I did have one beef (it wouldn’t be a true Movie Mind review without one): the ending bothered me. Hopefully it won’t be a spoiler to say that it was way too reminiscent of Reservoir Dogs. It gets cooky in the end, and including the final shot in the whole movie, which pisses imagery down our throat, it could have done without it. It was too good of a movie to use those tactics, but I guess Scorsese wanted to go overboard this time for those quacks in the Academy. Who could blame him? Either way, it’s too good of an overall film to be ruined, thankfully. It’s one that will be added to the personal collection of The Movie Mind as soon as it is released, and I suggest it gets added to yours as well. Agree…but different genres. Hard to compare. But still a good point. I feel like The Simpsons Movie will be one of those Ace Ventura or Wayne’s World movies that I will watch over and over again. The Departed, while a great mob movie, is still a mob movie. ugh. I ‘still’ watch Casino, Goodfellas, The Godfather, and Donnie Brasco when ever I get a chance. I love Scorsese and really enjoyed this movie, but it was a complete copy of Infernal Affairs, only set in Boston instead of Hong Kong. I can’t believe they gave him a best picture for a remake. Director yes, but picture?